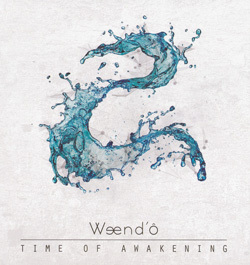 A progressive band who straddle the rock/metal divide, the oddly-monickered Weend’ô are a quartet from France whose second album ‘Time Of Awakening’ – previously available in limited formats but now spruced up for an ‘international edition’ courtesy of Sonicbond – is a real showcase for the seemingly limitless horizons of progressive music. Treading a fine line between the familiar and the innovative, ‘Time Of Awakening’ presents an atmospheric melange of styles, and between them Laetitia Chaudemanche (vocals and keyboards), Térence Nguyen Van (guitars), Maxime Rami (bass) and Nathanaël Buis (drums) have crafted an exciting release which both tests and indulges its audience. The title track itself is split into three parts and takes up almost half the album’s running time. ‘Part I’ is a slow-burner which builds into an belligerent terrier with Tool-like riffs and an excitable keyboard solo to round things off. ‘Part II’ is a more piano-led piece, with an atmospheric interlude giving way to the third and final piece of the composition’s jigsaw and the heaviest part of the song, with razor-sharp riffing and haunting melodies. At eight-plus minutes, ‘Angel Dust’ is the longest single piece on the album and a progressive metal fan’s dream, veering between gentle, harmonious soundscapes and full-on, turned-up-to-eleven aggression. The final cut ‘Elea’ is again split into two parts, and the low-key opening of ‘Part I’ contrasts sharply with the closing onslaught of the previous cut. It’s not long though before gears change and the track bares its teeth, and a superb solo from Térence Nguyen Van bridges the divide between the first and second parts of the song: and if you listen to nothing else on this album, take it from me that ‘Elea Part II’ is a beautiful and stunning piece of music. There’s no slouches in this band, as top-drawer musicianship pervades the album, although Ms Chaudemanche’s demonstrative vocals do add an extra dimension to the material served up. The digipack, by the way, runs off with a four-minute radio edit of ‘Angel Dust’ which – unusually for such things – actually condenses and consolidates the key elements of the song to present it in an entirely different light.